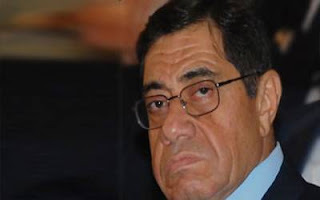 Egyptian Chronicles: And we got rid of Abdel Maguid Mahmoud Somehow "Updated : Not really"
And we got rid of Abdel Maguid Mahmoud Somehow "Updated : Not really"
And we got rid from the Public prosecutor after nearly two years of demanding this at last. President Morsi has asked Abdel Maguid Mahmoud if he is willing to be re-assigned as Egypt’s ambassador in the Vatican and to leave his position as the public prosecutor in Egypt. Mahmoud’s assistant Judge Adel El Sayid is appointed as the acting public prosecutor. Morsi can’t fire Mahmoud according to the law thus he found this legal exist after nearly 6 hours meeting with judge Mekki brothers “His VP and minister of justice” , Judge Hossam El Gheriany “Head of Supreme council of judiciary , head of National human rights council and head of constituent assembly and PM Qandil to discuss the implications of yesterday’s battle of the camel’s trials verdicts. Anyhow the court’s verdict yesterday in the battle of the camel’s trial is not the mistake of Mahmoud but rather the ministry of justice and the magistrates. People are praying now , especially in the revolutionary sphere that Judge Zakaria Abdel Aziz would be chosen as Public prosecutor. I highly doubt it because Abdel Aziz is independent Nationalist person whom the MB will not like. I hope that this decree would make the MB do not go and protest tomorrow in Tahrir square because I do not want any clashes there. Now many people from Non Islamists fear that this decision will be the start of Muslim brotherhood full control on judiciary , well I am afraid the removal of Abdel Maguid Mahmoud has been an old revolutionary one since the 18 days. The man is not good and was an accomplice in hiding Mubarak’s regime crimes through out the past years. Hell there are files and cases that have been closed by this man that need to be opened !! Again the position of public prosecutor is just like the President , unlike what the MB thinks, it is not a picnic or just a powerful position.